Mrs. Mildred Strong De Mott, Victorville, California. Mrs. Mildred Sumner, Carlsbad, California. We are grateful to María Ramos Martínez Bolster, Margarita Nieto and Louis Stern for their assistance in confirming the authenticity of this work. It will be included in their forthcoming catalogue raisonné of the artist's paintings to be published by the Alfredo Ramos Martínez Research Project. Alfredo Ramos Martínez's artistic legacy includes his artistic production both in his native Mexico and Europe as well ad his many murals, drawings and paintings executed during his artistic exile in the United States from 1930 to 1946. The artist, although a remarkable teacher who upon his return from years in Europe revolutionized the way art was taught at the Escuela Nacional, has never been fully recognized as one of the founders of modern art in Mexico--largely due to his long absence and the dominance throughout the 1930s and 1940s of the so called "Big Three" muralists--namely Rivera, Orozco and Siqueiros both in Mexico and in the United States. His oeuvre from 1930 onward celebrated and promoted an aesthetic at once nationalistic yet utterly modernist. 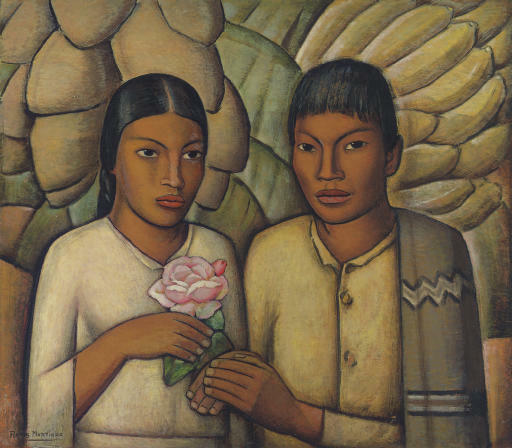 His numerous paintings, which focus on Mexico's indigenous population, are startlingly modernist compositions uniquely imbued with a personal vision of both Modernism and Romanticism. Although seemingly contradictory--Ramos Martínez's blend of two disparate artistic languages, allowed him to pursue a creative output that rivals the work of many of his contemporaries whose concerns were primarily a new art for a nation which sought to rejoice in an utopian national identity. Casamiento indio, ca. 1931, depicts a tender look at both youth and a passage to adulthood. The composition--a young couple who shyly hold hands--demonstrates some of the qualities favored by the artist: a close-up composition which is at once monumental but poetic; beautifully rendered images that reflect his understanding of Cubism but also Art Deco tendencies so prevalent in his newly adoptive home of Los Angeles; the use of curving lines, and sinuous shapes that create a rhythm between the subject and background. Sparse but nevertheless eloquent--the work remains fresh and vibrant even after more than seventy-five years after its execution. (1) The young woman's eyes do not meet our gaze but instead, her companion almost smiles at us with sheer happiness. The artist uses soft geometric shapes to describe the lush fruits--coconuts and bananas that are part of the background, which resembles the cloths of honor so favored by the Renaissance masters Ramos Martínez had studied during his years abroad in Europe. The inclusion of an impossibly large rose--a flower so loved in Calirfonia--symbolizes the couple's love. In their somewhat awkward pose--they are nonetheless--utterly human and engage us in their contentment. The painting as well, is in keeping with the Mexican tradition of documenting important personal events such as a wedding and is referred to as el retrato matrimonial (marriage portrait) which dates back to colonial times. This painting was once owned by Mrs. Mildred Strong De Mott who met Ramos Martínez in the 1930s and in whose ranch in Yucca Loma the artist stayed and executed a mural. (2) The ranch, in its heyday in the 1930s and 1940s, hosted many a celebrity. Through its gates Hollywood greats such as Clark Gable, Tyrone Power, Ingrid Bergman, William Holden and others, would pass and spend idyllic hours in the setting of the Mojave Dessert. In was in this setting, that her children, Frank, Ann, and Bunny would grow up--knowing nature and close to the land. Mrs. Strong De Mott collected additional works by the artist such as Flowers of Mexico (which sold in the Latin American Sale, May 2007) and set a record for the artist. This rather poetic painting was also part of the legacy she bequeathed her heirs. 1) Dating for painting is circa 1931. 2) In the early 1930s, the artist's daughter, required medical attention; Ramos Martínez moved his family to California for better medical treatment. The artist met a wonderful group of people who would become his friends but also avid collectors and patrons. Rancho Yucca Loma was owned by Mrs. Gwendolyn Boynton Behr and Mrs. Mildred Strong De Mott. The two were inseparable friends since youth. Mrs. Boynton Behr's mother, Catherine Boynton Thayer had financed the ranch in the dessert. Please note a certificate of authenticity signed by Mr. Louis Stern accompanies this work.